The Texas roots-rocking Garza brothers join the Christmas parade with their first collection of holiday tunes, and strike a nice balance between the spirits of rock 'n' roll and yuletide. Their covers of the classics range from the straight-ahead rock 'n' roll of "Santa Claus Is Coming to Town" and "Run Run Rudolph" to the pure reverence of an instrumental take on "Silent Night" through the Latin blues of "Feliz Navidad" and the outright goofiness of "Jingle Bells." 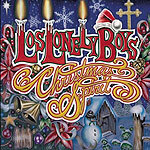 Los Lonely Boys also wrote two new holiday songs, opening the album with their own aching "I've Longed for Christmas" and the uptempo "She'll Be My Everything for Christmas." Neither is exactly Bing Crosby, but they do have a touch of holiday charm.